The War of Nations was a storyline in GemStone that took place in 5103. In later times historians would call the year 5103 a dark year; a year fraught with chaos and strife. It began simply enough, with the arrival of a blue-tailed comet called the Blue Rider. For the Trolls, the comet was an augury that called forth half-remembered prophecies and legends. The Krolvin hailed the celestial event as a harbinger of victories to come. The Elves looked upon it with little more than mild intellectual curiosity. To the Empress of the Turamzzyrian Empire, beginning her tenth year on the throne, the comet was a sign of the blessing of the gods. But to her vassal, the Baron Hochstib... it meant war. War of Nations Summary is an Official GemStone IV Document, and it is protected from editing. "History is written with the blood of fallen heroes." 1.4 NEWS FROM THE HUMAN EMPIRE: A TIME OF CELEBRATION! 1.10 THE EMPRESS IS DEAD -- LONG LIVE THE EMPEROR! The Observatory in Ta'Illistim has noted the arrival of an interesting astronomical phenomenon -- the Blue Rider, a large blue comet which returns to the northern sky once every 1,047 years. Over the next three months, the Blue Rider will continue to brighten as it travels slowly from north to south across the heavens. Amateur astronomers are invited to visit the Observatory in order to inspect the comet more closely. To celebrate over a decade of the reign of Her Imperial Majesty the Empress Mynal'lyanna Anodheles, the king of the gods has sent a sign of His approval -- a wondrous blue comet, displayed before all eyes as a beacon of His will in the heavens above. In humble acceptance of the will of the gods, Her Imperial Majesty will embark upon a tour of all lands in the Turamzzyrian Empire so that all citizens of the Empire may share in the blessing placed upon her. As the comet travels from north to south through the sky, Her Imperial Majesty will visit each of the duchies, earldoms, baronies, and counties in turn. Her Imperial Majesty will meet in council with the head of each of the noble families in the Empire, and She will permit Herself to be viewed by the people of each of the capital cities. Prepare for celebration and revelry in the streets! A wondrous time of great joy and blessing has come to the Turamzzyrian Empire! With the arrival of the War of Nations, rumors are sure to be flying. In order to keep fact straight from fiction, and to make sure everyone has access to the facts, we at Simutronics are pleased to present the Reporter's Initiative. 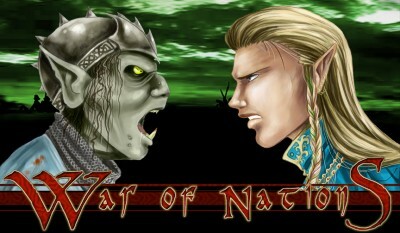 The GemStone News site will be hosting information about the upcoming War of Nations. To demonstrate how much we appreciate it when people give their time and effort to make other people aware of events in Elanthia, we will be rewarding people who write summaries of news events for the War of Nations with small experience awards. These awards will be very much like standard roleplaying experience awards: they will combine a small amount of experience with a temporary multiplier to enhance your experience gain. Joe Axe may be off smiting ogres while you participate in a roleplaying event, but you could gain even more experience than he does, and having twice the fun too! Whenever something occurs related to the War of Nations, write a summary of the event within 24 hours of the occurrence and submit it through the GS3News website. The organizers of the website will search through the submissions and select the two most detailed, best-written summaries. Those two summaries will be edited for grammar and spelling and then posted on the GS3News website, and then the authors of those summaries will receive experience awards. What's not to like about it? Nothing! So, get out there! Keep your eyes open, your ears pricked, and your pen ready, because the next War of Nations event, whether it's big or small, could be right around the corner... and then you could be the one sitting smug and happy with an experience award to boost your learning and brighten your day. NEWS FROM THE HUMAN EMPIRE: A TIME OF CELEBRATION! Aurmont Anodheles is the first cousin of the late Empress. Considering the circumstances of his position, it is not believed that he has any relation to the assassination of Mynal'lyanna Anodheles, and his surprise and grief over his cousin's death are widely believed to be genuine. Aside from an appropriate respect for the Church of Koar, Aurmont's religious inclinations are unknown at this time, and he is not noted for strong views regarding Chaston's Edict. His intentions regarding the late Empress's desire to expand the reach of the Turmzzyrian Empire are also unknown. However, there is no doubt that all will become clear as the new Emperor's reign progresses. Thy Empire hails thee, Aurmont Anodheles, and the new era marked by your reign! The leaders of the Parkshnuum Clan issued a statement regarding the death of the Empress Mynal'lyanna. The statement condemned regicide as a whole, but condemned the choices of Mynal'lyanna's rule as well. In part, the statement read, "While the murder of any legitimate ruler is an undeniable crime, the legitimacy of a ruler who permits and encourages the enslavement, degradation, and murder of a free people must be questioned. Her successor should learn from this example and be more intelligent in his actions. When no mercy has been offered, no mercy can be expected. We do not condone regicide, but Mynal'lyanna's death can only serve as a lesson to the rest of the world." The Parkshnuum dwarves are known to be particularly bitter toward the Turamzzyrian Empire due to the actions of Baron Hochstib of Jantalar, who enslaved the dwarves living in the province of Talador and killed hundreds of their number in 5094 as a show of his power. A diplomatic emissary conveyed a message from Ta'Illistim, expressing the regrets of Ta'Illistim's queen in regards to the untimely death of Mynal'lyanna Anodheles. In part, the message read, "The citizens of Ta'Illistim mourn the passing of Mynal'lyanna Anodheles, and we fear that the planned renaissance of her reign will die along with its creator. We invite Aurmont Anodheles to accept the available opportunity to usher in a more civilized way of life for his people." The emissary left as soon as the message had been delivered. No official response to the emissary's message was available, but tensions between Ta'Illistim and the Dwarven clans are expected as a result. A diplomatic emissary from Ta'Nalfein arrived in Vornavis yesterday and presented herself to Baron Malwind. With all appropriate ceremony, the emissary expressed her regret at the assassination of Mynal'lyanna and offered the aid of Ta'Nalfein in the search for the assassin. Baron Malwind thanked the emissary for this offer and invited her to enjoy the hospitality of Vornavis for the interim, but the diplomat declined, saying that her responsibilities in Ta'Nalfein would not permit her to remain. She thanked Baron Malwind for his civility and hospitality before departing early this morning. THE EMPRESS IS DEAD -- LONG LIVE THE EMPEROR! On Charlatos 3, thousands of people knelt in Tamzyrr to honor His Imperial Majesty, Aurmont Anodheles, as the imperial crown first graced his head. The time-honored rites of the coronation were completed without any mishap, and Phoen's golden orb shone down from a cloudless sky as His Imperial Majesty swore to lead and guide the united Turamzzyrian Empire for all the days of his life. May the blessings of Koar be forever upon him! The only son of Turallos Anodheles and Ayibma Chandrennin, Aurmont Anodheles was born in the city of Elstreth on Imaerasta 27, 5070. Despite being born beneath the Trident, Aurmont has shown little predisposition toward violence. As an adolescent, he served as a squire on the Demonwall, but his position was largely the product of his family influence, and a few years were ample time to demonstrate to young Aurmont that he was not destined for a martial vocation. He has spent the last ten years of his life within the walls of Chantry College in Nydds, studying the histories and tomes describing the Turamzzyrian Empire's past. At this time, His Imperial Majesty is unmarried, leaving the line of succession in doubt if anything should happen to the new Emperor. While many young noblewomen hope to remedy this situation shortly, His Imperial Majesty's attention clearly lies far more with determining why he is Emperor than determining who else will be Emperor next -- the issue of Mynal'lyanna's death and the responsibilities of his new position lie at the forefront of the Emperor's attention, and more personal matters will simply have to wait. As chroniclers race to search the histories for information about His Imperial Majesty's heritage, the nobility of the Empire studies the record of his life for indications of his political leanings, but little is to be found. Despite Aurmont's distaste for his environment, he served nobly and well in his time as a squire. His best-known essays from his time in Chantry College are strictly limited to examinations of the motivations and effects of actions taken in Turamzzyrian history; they contain none of his own views upon political matters, and so they serve very poorly as fodder for those who seek to know him better. Between his upbringing in Aldora, his maturity in South Hendor, and his mother's own worship, it is understood that His Imperial Majesty holds an accustomed respect for the temples and monasteries of Voln, but his private religious feelings are unknown. Some have speculatively noted that the cities of Elstretch and Nydds share a similar attitude of acceptance toward ordlyn and hathlyn, accepting them as near-equals, which is rare among the southern territories. Others dismiss this as coincidence, pointing out that any wealthy scholar would seek out the scholastic center of the Empire regardless of personal views on foreigners and half-breeds. The comet still glimmers in day and night sky alike, just as it shone over Emperor Aurmont's coronation. Some secretly whisper that heavenly grace has left the Empire with the death of Koar's chosen, but others say that Mynal'lyanna's death was guided by the will of the gods. At this time, Aurmont himself seems to be setting the question of Koar's will aside in favor of uncovering the secular answers to his cousin's death. Some of the more superstitious citizens of the Empire have taken to wearing lockets containing the Emperor's miniature as a way to ward off any curse the comet may bring. Others have taken to wearing all black as they live "in mourning for the Empire," or marking themselves with tattooed or painted blue patterns in order to "draw the comet's blessing into their minds." The lockets are generally approved-of by lawmakers and authorities, but the tattoos and the mourning garb are not. Several of the black-robed mourners have killed themselves or others, and at least three blue-painted citizens of the Empire have gone mad. Zul Logoth has been devastated by a fierce plague blazing through their ancient home. At this time, no cure is known, though herbalists and scholars of all kinds are frantically searching for a way to help the afflicted. Neither herbs nor empathic treatments have proven useful, nor has any spell, including the old empathic standby of Cure Disease. Rumors of many kinds regarding the plague have spread through dwarven lands, and there is great concern among dwarves and non-dwarves alike regarding the matter. No confirmed cases have been recorded among non-dwarves, although there have been several false scares. Among dwarves, however, the plague is both swift in dealing death and highly contagious before death arrives -- and it is no longer limited to Zul Logoth: victims of this mystery plague have been found in Wehnimer's Landing and Ta'Illistim, and at least one person has traveled as far south as River's Rest before succumbing. The symptoms of this disease are harmless enough at first: the victims sneeze and cough, often experiencing a sore throat as well, but they suffer no more than they would when afflicted with a common cold. As time goes by, the symptoms grow more severe, and victims develop small sores on their skin that will not heal properly. As the sores develop into greyish pustules and boils, the coughing grows worse and worse until the victims begin to cough up blood. At this point, it is difficult for the victims to speak or to breathe, and death follows not long after. Dwarven healers agree that instituting a quarantine would be futile as well as cruel at this point. Prince Borthuum of Kharam Dzu has expressed his sincere sympathy to the victims and offered to send aid in researching a cure, but hopes are not high at this point. The cruel pirates known as the Sea Wolves have long been feared and hated in the area around Solhaven Bay for their cruelly imposed blockade. Upon the evening of Olaesta 12, the Sea Wolves sent a massive invasion force to loot the port city of Solhaven, but the town was prepared for their onslaught -- powerful magic users becalmed their seven troop ships within the harbor, trebuchets bombarded the Sea Wolf vessels, and a trireme laden with enraged volunteers set sail to fight the pirates face to face. Within minutes, three of the ships were sunk, and the remainder were successfully captured by residents of Solhaven and assisting adventurers from surrounding cities. The surviving Sea Wolves have retreated to lick their wounds and regroup, for this colossal failure has left the pirates with barely enough crew to sail their ships, let alone attack again. Merchant vessels still avoid the area, not willing to risk their livelihoods so swiftly, but, by and large, the citizens of Solhaven are relieved to foresee the end of the pirate dominion. ...which prepares a path for war that leads directly to Wehnimer's Landing. The dwarves of Zul Logoth are dying, and many of their kin abroad have been stricken as well. Terrible earthquakes released a strange red dust into their ancestral homes, and a virulent plague has followed. The plague causes coughing, sneezing, pustules and boils, and unavoidable death in those who contract it. At this time, most dwarves accept that the plague is indistinguishable from the Red Rot of Despana's age. In the Age of Chaos, over half the population of the great dwarven city Kalaza died to the Rot, and the gates of Kalaza were hidden and sealed forever to contain the foul disease. Quarantine is impossible, now -- innumerable cases of the disease have been recorded outside Zul Logoth. If this is the Rot, it will not be contained a second time. Yet, the gods often grant a shining ray of hope to pierce the stormclouds of despair, and such a ray has come now. An alchemical lab has been established in Zul Logoth, and dwarves and non-dwarves alike have volunteered countless hours of work to search for a cure to the disease. Further hope comes with the arrival of several hooded strangers, who have indicated great knowledge of botany and healing, and some people believe their aid can conquer in this modern age what could not be conquered in the past. ...and perhaps their mission is not one of peace, after all. Upon Teras Isle, doors are locked and windows barred against the incursions of the fearsome krolvin. Led by the Czag Dubra, the bloodthirsty slavers have assaulted the dwarven city of Kharam Dzu in a rampage of torture and slaughter. The krolvin fight with savage skill, and they claim to draw their power from the blue comet blazing through the sky, calling upon it as they summon magical energy. Distracted from the troubles of their kin in the east, dwarves and visitors have joined forces in order to protect their homes and the famous glaes mines of Kharam Dzu. Upon Ivastaen 18, the good ship Glaesen Star was attacked by krolvin raiders during a routine voyage between Wehnimer's Landing and Kharam Dzu. The passengers rallied under the leadership of the dwarven prince Eregrek Borthuum, and they succeeded in repelling the invaders, but the Glaesen Star suffered structural damage as a result. For most of a week, travel between the isle and the mainland had to be suspended for repairs. Some say that Borthuum's intent was to set an ambush for the krolvin, but this ambush resulted in the five-day estrangement of Borthuum and the brave defenders of the Glaesen Star from Teras Isle. ...and, with the Red Rot crippling the strength of the dwarves, perhaps it is time for a new master upon Teras Isle. ...for the comet has not left Elanith's skies, and the worst is yet to come. In fact, it is only beginning. For months now, Teras Isle has struggled against the force of an invading krolvin army. Led by the Czag Dubra Moragda, backed by the weight of the krolvin nation, and guided by the power of the blue comet overhead, the brutal krolvin slavers died by the dozens -- for Teras had assembled an army of its own, an army of brave, steadfast adventurers who could hold the city of Kharam Dzu against the attackers. It seemed that, despite all odds, Kharam Dzu would survive the onslaught. Then, an emissary from the krolvin nation arrived to give new instructions to Bloodfist Sankir, second-in-command to the Czag. The emissary informed Sankir that Moradga had been put to the question over her failing to secure the island with sufficient speed, and, as a result, she would not be returning to Kharam Dzu. In appreciation for her reports about the failings of Moradga, Stormcrow Akhri was designated temporary Czag -- an act that infuriated Sankir, because Sankir believed Akhri to be traitorous to the krolvin people. The emissary commanded Sankir to return with him to the war council and undergo the question as well, for Sankir had been accused of dealings in black magic forbidden to the krolvin. Angered by the fate of Moradga, and outraged by the appointment of the traitor, Sankir went berserk. He murdered the emissary and slaughtered Czag Dubra Akhri, whereupon the krolvin fell to battling themselves -- the council loyalists versus the followers of the Bloodfist. The accusations of the krolvin war council were shown true when Sankir used Akhri's corpse and the corpse of a council loyalist in some perverse, soul-tearing ritual. The body of the emissary was dismembered beyond repair, and none of the council loyalists survived the massacre. Krolvin troops still hold the western half of Kharam Dzu, but Sankir and his troops have abandoned Teras Isle. Sankir swore after he slew Akhri that he would lead those loyal to him off to the mainland, there to establish a new krolvin domain. The brutality and bloodlust of the krolvin are recorded at length by legions of dead citizens from every existing nation. The krolvin are so vicious that they will put their own people beneath the question, a process only mindless hulks survive. What manner of magics are so evil that the krolvin forbid them? If reports from River's Rest are correct, and blue-skinned scouts have been seen in the vicinity, then the human empire may soon find out. Dwarves everywhere rejoice! After months of study and labor, dwarven alchemists have triumphed over the lethal disease plaguing their people. The cure is a magical potion that augments the soul and strength of the dwarven people, so powerful in its qualities that the rot cannot keep its grasp. Not only does the curative potion immediately heal a victim of the disease, but it apparently prevents the victim from ever contracting the disease again -- once gone, the Rot stays gone. Stores and shops in the dwarven city of Zul Logoth have reopened, now that the threat of contamination is gone. The elves of Ta'Illistim and Prince Borthuum of Kharam Dzu have also expressed their congratulations (and their relief) at dwarven victory over the plague. While on a diplomatic mission to Ta'Illistim, Prince Eregrek Borthuum and his Dwarven Honor Guard were attacked by a large party of trolls. During the attack a large grey troll slugged Prince Eregrek in the face with a blackjack, picked him up, slung him across his shoulders and carried him off. As of this time it is not known if the Prince is dead or alive. Searchers are combing the hills and forests outside the city, but large parties of trolls hinder the search. This page was last modified on 29 June 2017, at 10:51.